Canadian Social Assistance Review: Ontario Commissioners Want Your Feedback By March 16, 2012. During April, May and June, we’ll take “Premier McGuinty” – a life-size mannequin – to 40 communities around Ontario to challenge the budget’s freeze on social assistance rates. This province-wide campaign will give people who receive social assistance, plus community service providers, an opportunity to describe how the rate freeze and other budget measures affect them. The “Hey Premier, Listen Up” tour will also focus on the Social Assistance Review Commission, whose final report is expected in June. The Put Food in the Budget Campaign demands that Commissioners Frances Lankin and Munir A. Sheikh recommend improvements that would allow Ontarians with the lowest incomes to lead healthful, dignified lives. 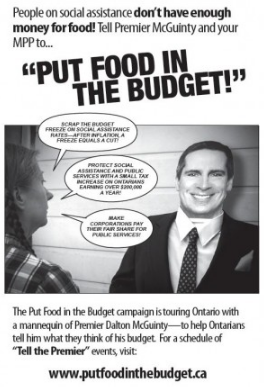 The Put Food in the Budget campaign includes representatives of groups whose members are people whose income is social assistance, as well as community faith and labour organizations in thirty communities across Ontario. To arrange for “Premier McGuinty” to visit your community , please email bookamcguinty@gmail.com or call 647-985-7342. Also, please click here to send a letter to Premier McGuinty, urging him to maintain his commitment to reduce poverty and increase social assistance rates immediately. Please click here to join in on the conversation of the Put Food In The Budget tour on Facebook! Also, for more info, please click here.